El Reg's storage sheepdog has been out on the hill and gathered a flocklet of storage news. Our tenacious collie has found seven new arrivals; one that's been lurking around for five years and another is an existing woolie promoted. But there are impressive rams as well among these two moving lumps of old mutton. Growing startup companies often switch from a founding CEO to a professional and experienced build-the-company-to-IPO chief exec. The incoming CEO then makes business infrastructure and go-to-market changes to scale the company up to and beyond, say, a $100m annual revenue run rate. Cohesity has not done that. Instead founder and CEO Mohit Aron recruited Rob Salmon from NetApp to be president and COO, and he's done some executive reshuffling to better position the company for growth, particularly as a large enterprise supplier. Salmon says: "Yes there have been a couple of departures but we're building a robust team." CFO Seamus Hennessy left for personal reasons and is still advising the company. There was no disagreement about business fundamentals with him. He told us Cohesity has passed the $100m run rate in its current quarter, which is the best in the company's revenue history. More executives are being hired, such as a VP for customer support, in the next couple of weeks. Salmon says Cohesity's staff will be extended by additional hires with complementary skill sets. It's the Salmon era at Cohesity as Aron's number two reshapes the company for growth to, shall we say, a $500m run rate and beyond. We're hearing Nutanix has just replaced all the SANs (HP and Netapp) at one of the largest public school systems in the USA. There will be some 50 all-flash nodes running the Acropolis hypervisor (AHV). It will deploy 22 of the 50 nodes on AHV initially and migrate the other 28 from their VMware starting status as fast as is practicable. This customer has 56 sockets paid for for the next two years and does not expect to pay any more to VMware. The customer reckons to save $15m over five years by using Nutanix instead of other kit, with – wait for it – $6m of that in cost avoidance of VMware. US Apple-focused memory, flash and external storage supplier OWC has a ferociously fast external flash drive, the Thunderblade V4. It uses Thunderbolt 3 to deliver up to 2.75GB/sec write and 2.45GB/sec read bandwidth and has from 1TB to 8TB of capacity. The thing comes in a rugged aluminium case and is for media professionals and others needing to shoot large video files and transfer them to a host for processing as quickly as possible. It works with any Thunderbolt 3-equipped Mac and has a three-year limited warranty. The best performance comes if the Mac has a PCIe x4 Gen 3 Thunderbolt 3 port. The drive has no fan; the ribbed case is the effective heat sink for the four Samsung M.2 flash drives inside, and a dimmable activity LED. Thunderblade V4 cutaway pic with 4 x Samsung M.2 SSDs inside. Seagate's LaCie unit says its Bolt3 does a similar 2.8GB/sec. 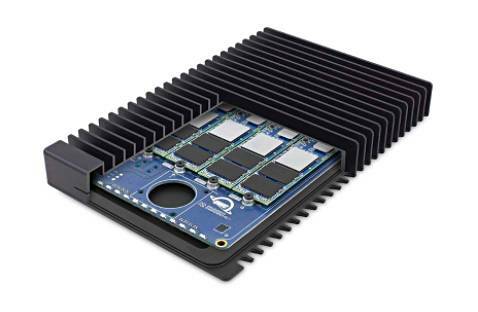 That drive has two 1TB M.2 format SSDs inside which are striped into a 2TB volume, with bandwidth to reach 2.8GB/sec. 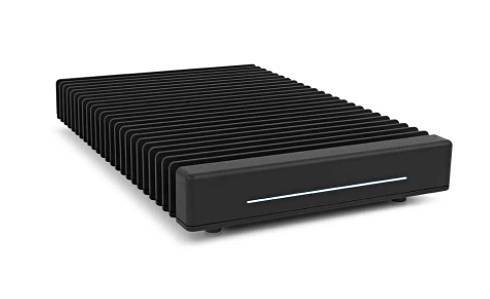 We're told a pair of Thunderblade V4s in a RAID 0 config will produce up to 3.8GB/sec, blowing the LaCie drive away. The price for 8TB is eye-watering – $4,999.99 – but a Thunderbolt 3 cable is included for that to reduce tear duct activity just a little. Scale Computing,a hyperconverged infrastructure system supplier, has a partner in South Africa, Axiz, which is an IT infrastructure and software distributor. It will resell the Scale HC3 platform, combined with Lenovo servers, as a simple to use and easy to deploy hyperconverged product for the midmarket. Axiz has a strong presence in South Africa and offices in strategic countries in the south and east of the continent. It has demo Scale clusters at its head office in Gauteng. Spare processing power from the cluster is donated to charities. This company has promoted John-Marc Clark from VP product marketing to vice president of marketing. He joined SoftNAS August 2017, having previously been at Citrix as managing director, Global Systems Integrator (GSI) Sales Team. He was responsible for the Fujitsu alliance team, growing that partnership into the company's largest out of 9,000+ partners. New year, new office; SoftNAS has also relocated its corporate headquarters to Park Laureate at 10000 Memorial Drive, Suite 888, Houston, TX. Virtual SAN system and now Edge Computing-focused supplier StorMagic went on a Caribbean holiday five years ago. It says the Maho Group is the Caribbean's leading leisure, real estate, gaming and resort company, and it bought StorMagic kit then. The equipment was for its facility on a small island nation, St Maarten, which apparently is plagued by power outages. We recall that Hurricane Irma devastated the island a couple of months ago, which cannot have helped the infrastructure at all. The Maho Group's properties are spread out over 25-30 separate buildings, and it wanted to implement virtualized servers. It couldn't afford external SANs so it went for virtual ones instead. Director of technology Huub Lambooy said: "Power outages are a regular occurrence on the island – even with triple protection on infrastructure like power sources and generators. So minimizing downtime and disruption in these scenarios is critical for the survival of our business. The StorMagic SvSAN's lightweight architecture minimized hardware costs and maximized uptime with the necessary shared storage for VMware." The Maho Group installed StorMagic's SvSAN, with stretch cluster capability for added resiliency, in 2012. Since then it has experienced zero unplanned downtime and increased reliable application uptime. Very good, but a case study now? Five years after initial deployment? Weird. UK-based replication tech supplier WANdisco picked up a contract through OEM partner IBM worth $4.32m in royalty payments. The customer is an international financial institution and it has bought IBM's Big Replicate, the rebranded WANdisco Fusion product.